We write this letter in response to the LGBT Community Center’s recent receipt of life-threatening and hate-filled letters. Our board of directors condemns this menace and expresses vigorous support for the Center and its longstanding service to our youth, friends, families, and community at large. Unfortunately, hate and threats are not new to us, as our civil rights movement was born out of response to contempt, violence, and a sociopolitical environment that ignored the AIDS epidemic with catastrophic consequences. Regrettably, we must face the mournful fact that violence remains a life or death issue for far too many in our communities. It is an epidemic that strikes at the heart of freedoms we all assume to share, and appears to be worsening, especially for our transgender siblings of color. Understandably, many across our neighborhoods feel fear and anger. However, we must pledge to direct our anger, convert our fears, and labor together to summon the courage and cooperation to change our culture. With innovative outreach, prevention, education and effective policy making, we believe we can dismantle the conditions that support violence in all forms. It is a struggle that looms large, especially in our gun-ridden society, but essential if we want to sustain the values that make our communities and country truly inclusive. Those of us with power and privilege must use our platform fearlessly. We must continue to address the overarching problems of poverty, discrimination, housing instability, criminalization and unemployment that impact our community and many other marginalized groups. We can only do this by strengthening weak ties and building many partnerships. We believe that together we will not be deterred from our shared mission to create a region where LGBTQ individuals find safety, equity, and opportunities for leadership in these admirable efforts. 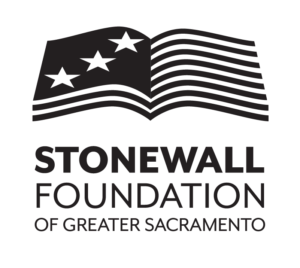 The Stonewall Foundation of Greater Sacramento is a 501(c)(3) organization; our federal tax identification number is 81-1849763. We are pleased to report that you received no goods or services in exchange for your contribution and that your gift is tax-deductible to the fullest extent of the law.